Peanuts came to the U.S. on slave ships, as an African crop. 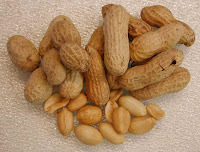 Two common names for peanuts, with African origins, are pinder and goober, hence the Civil War term "goober peas." As they were commonly available to enslaved Africans, and a good source of protien, peanuts were used in pies and soup, on many plantations. My mother used to make peanut soup when I was a child, in Berkely, CA. and I still crave it. I have turned my friends on to it and often get requests for this recipe, so here it is. Saute the onions and celery or celery seed in butter until they are soft. Sprinkle the flour over the vegetables and cook for 1 minute, stirring to coat. Add stock, salt, lemon juice, and peanut butter and simmer for 20 minutes. Allow the mixture to cool for 15 minutes, then puree in batches in a blender or food processor. The soup may be made ahead to this point and refrigerated. Serve it with a splash of cream or dolop of sour cream, a sprinkling of chopped peanuts (I like dry roasted for this), green onion or chives, and crutons.